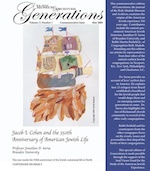 Beth Ahabah Museum & Archives’ journal, Generations, is published to recount interesting stories or to commemorate important milestones in Richmond Jewish history. Click on thumbnail image below to download a PDF of the document. 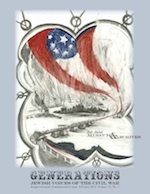 This edition of Generations was produced to mark the 150th anniversary of the American Civil War. Article subjects include: Jews and Slavery, Phoebe Pember’s experience as Matron of Richmond’s Chimborazo Hospital, sculptor Moses Ezekiel’s time as a cadet at Virginia Military Institute, Judah P. Benjamin, and Rabbi Maximilian Michelbacher of Congregation Beth Ahabah. The origins of the American Jewish experience are discussed by Dr. Jonathan D. Sarna of Brandeis University, Rabbi Martin P. Beifield, Jr., of Congregation Beth Ahabah, and representatives of four of the nation’s earliest Jewish congregations of Newport, RI, New York, NY, Philadelphia, PA and Charleston, SC. Historical and biographical details of Rabbi Calisch's life are presented along with remembrances of him by family and friends.